BETTY SUE (GORE) ALLEN, 86, of North Little Rock entered into eternal rest Sunday, October 7, 2018. She is preceded in death by her parents, Bennie and Georgia Gore; her Husband, Wallace Lavon Allen; and brother, Reecle L. Gore. She is survived by two sons: Stephen Allen and his wife LuAnne, and Larry Allen and one daughter, Rebecca Allen Davis and her husband Ben. 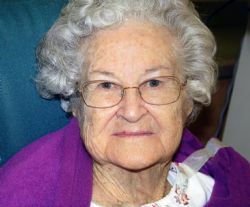 She was the loving ''Maw Maw'' of four grandsons: Russ Allen and his wife Emily, Austin Allen, Benjamin Davis and Connor Davis and one great grandson, Jarrett Allen. Visitation will be 5:00-7:00 PM, Wednesday, October 10, 2018, at Roller-Owens Funeral Home, 5509 John F. Kennedy Blvd. Graveside service will be 1:00 PM, Thursday, October 11, 2018, at Oakland Cemetery in Holland, Arkansas. In lieu of flowers memorials may be made to the American Heart Association, PO Box 841125, Dallas, TX 75284.